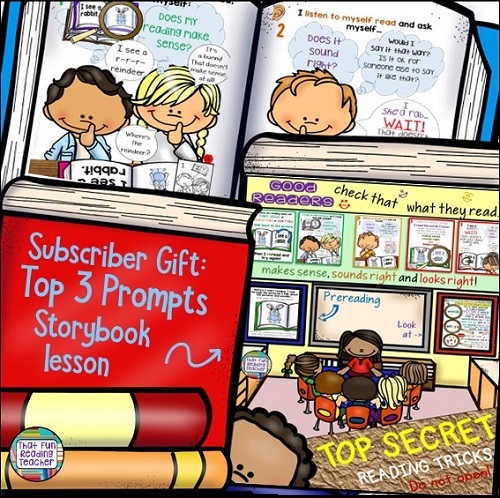 Are you teaching emergent readers the very basics of reading, and overwhelmed by the number of reading prompts to choose from? The following top three prompts form the basis of what good readers naturally do. The founder and creator of the Reading Recovery program, Marie Clay, studied the strategies proficient readers used. To put it simply, her research showed that children have the most success reading when they use meaning as their primary source of information (ensuring the story made sense), language structure (how the words sound together, ordered properly in the manner we would use them in speaking the language) and the ‘visual information’ (the ‘looking’ at the words, letters, punctuation, etc. part of reading). These three prompts are the foundation of what good readers do. Good readers make sure that what they read makes sense, sounds right and looks right. Other strategies fall under these, and do have their place. It can get complicated for kids to have to memorize a long list of strategies. My students have had most success when they know the top three prompts initially, then additional strategies (i.e. Chunky Monkey) for something that they truly need prompting for. Every child does not need to learn every prompt out there! The three top prompts bookmarks – free! I have just redesigned line art printable bookmarks with visual and contextual examples for each prompt, and a fourth bookmark summarizing all of the prompts together. What has been your experience with using reading prompts to teach emergent readers? Please share in the comments!